Tuesday, 7 December 2010 we headed to Coachella Valley Preserve, just north of Palm Desert. We went to the nice Visitor Center which is in an oasis of California Palms – there is such a thing as a real live oasis. 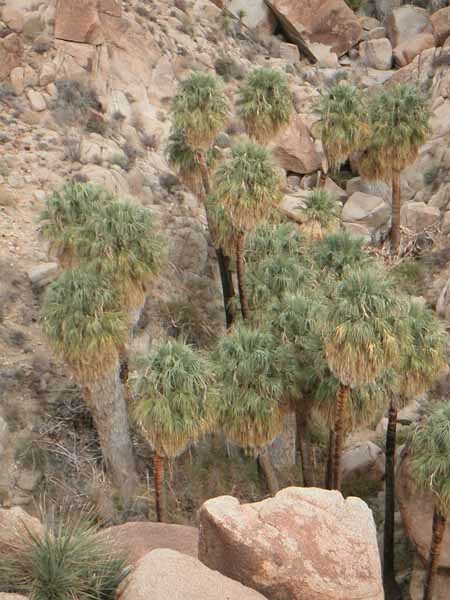 We decided to take a six mile hike to the Pushwalla Palms – they really do surprise you as you come around a switchback and there they are. 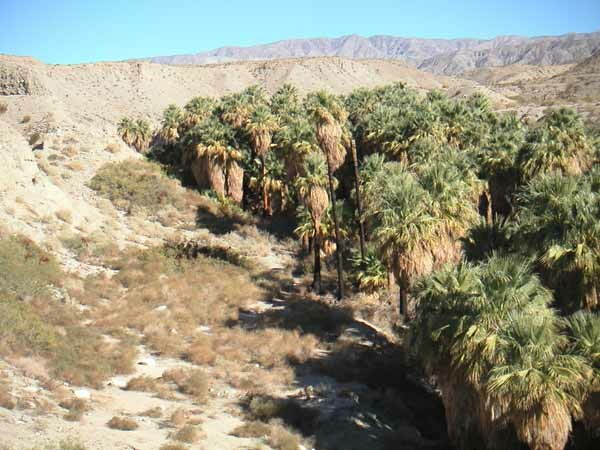 The palms grow out of the water that seeps through the San Andreas Fault, giving enough moisture to create this riparian oasis. So we walked down into the valley. We surprised a bunch of quails that sounded like a motor boat taking off with the beating of their wings. 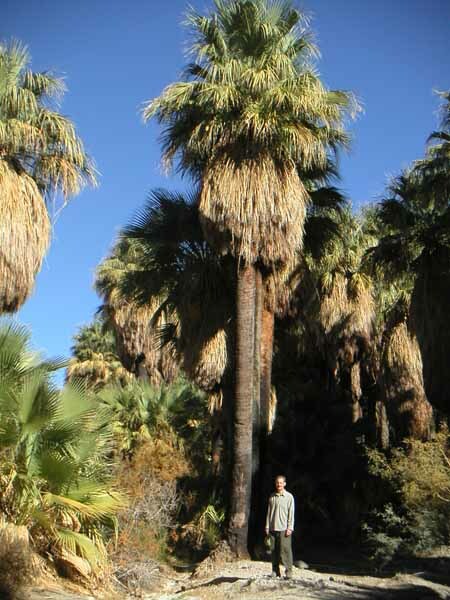 Here Henry posed to give a sense of scale to these native palm trees. 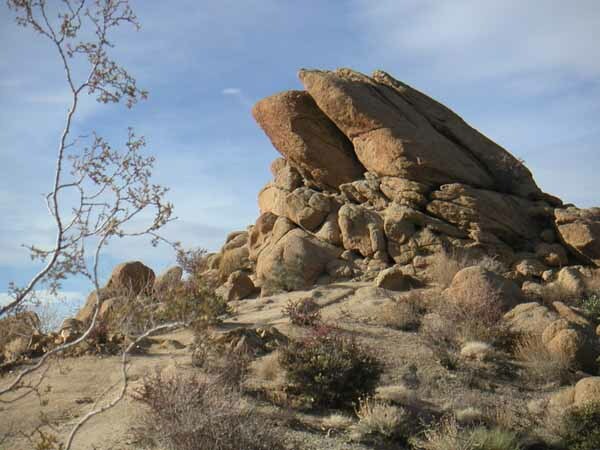 Wednesday 15 December we drove to the south entrance to Joshua Tree National Park. We chose a 9 mile hike to Lost Palms Oasis with a detour to Mastodon Peak to see a view of the Salton Sea. We had the pleasure of hearing a history presentation the night before at the library of the Salton Sea so it gave us some ideas to ponder while we walked. Quite an interesting variety of plants – yuccas, agaves, California firs, a desert holly, some sage – I am still working on my identification as many of these plants will not survive in Denver. But it is fun to see them in their native setting with some unique cloud formations. We found the Lost Palms 😉 It was worth taking a break and enjoying the view. The rocks/boulders are not as large here as they are further north in the park – but beautiful and sculptural. The southern part of the park is in the Sonoran Desert and this particular area is a sub section called the Colorado Desert. 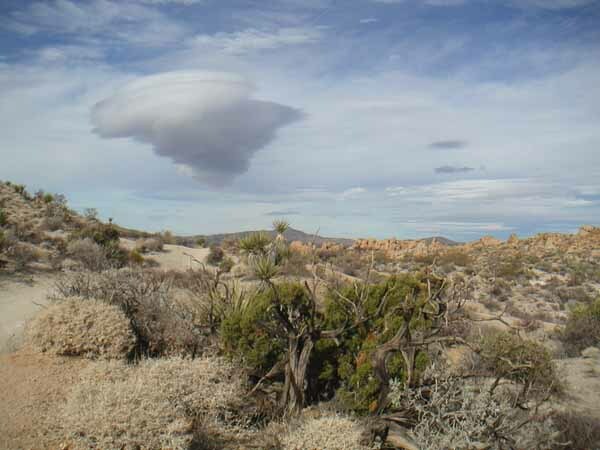 The northern part of the park is the Mojave Desert which is higher in elevation and also where the Joshua Trees grow. That is for another day of exploration. This entry was posted in California, Hiking, Palm Springs. Bookmark the permalink.